How much is Bikram Choudhury Worth? Bikram Choudhury net worth: Bikram Choudhury is an Indian yoga instructor who has a net worth of $75 million. He is known as the founder of Bikram Yoga, a form of hot yoga performed in a series of 26 hath a yoga postures done in a hot environment. He was born in 1946 in Calcutta, India and began learning Hatha Yoga poses at the ages of three. When he turned five, he started to study with Bishnu Ghosh and went on to win the National India Yoga Championship for three consecutive years in his teens. At age 20, Bikram claims he was in a crippling weightlifting accident. Although he claims that he was told he would never be able to walk again, with the help of Ghosh, he is said to have fully recovered within 6 months. He created a 26 posture series, which he claims restored his health. The 105 degree Fahrenheit heat in which Bikram yoga is practiced is, according to Bikram, meant to mimic the climate of India. Bikram emigrated to the United States in the 1970s and founded yoga studios in California and Hawaii. In the 1990s, he began offering nine-week teacher certification courses. Certified instructors now number in the thousands with Bikram Yoga studios all over the world. He holds a copyright for the 26 poses which constitute Bikram yoga under the same theory which allows choreographic sequences to be copyrighted. 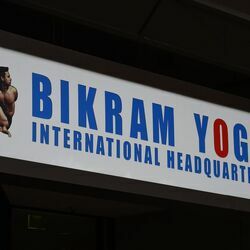 In September, 2011, Bikram filed an infringement suit against his former student, Greg Gumucio, who is the founder of a competing chain of hot yoga studios. In June 2012, the United States Copyright Office decided that since yoga poses claim to improve health, they are not eligible for copyright. This helped Gumucio maintain his business, but the decision did not relieve Gumucio of the need to defend himself against the lawsuit brought by Bikram. In December, 2012, Gumucio settled the suit with Bikram, agreeing to stop using the series of 26 poses by February 15, 2013. Bikram Choudhury is currently married to Rajashree Choudhury, who is the founder of the United States Yoga Federation. Thanks to his copyright, Bikram earns $7-10 million per year in royalties paid by yoga studios all over the world who wish to use his format and name.